Are all the components connected on the given Graph? 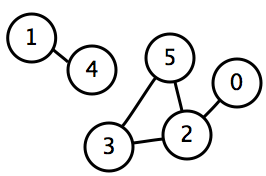 A graph is considered one connected component if every node is connected along a path with every other node. The following graph is not one connected component, since the 1 and 4 cannot be reached from the 0,2,3 and 5.